The Rev. Mark Pendleton with his sending Bishop, The Rt. Rev. Frank Cerveny of Florida (Class of 1958) on a mission trip to Cuba in the 1980s. Cuba is personal. 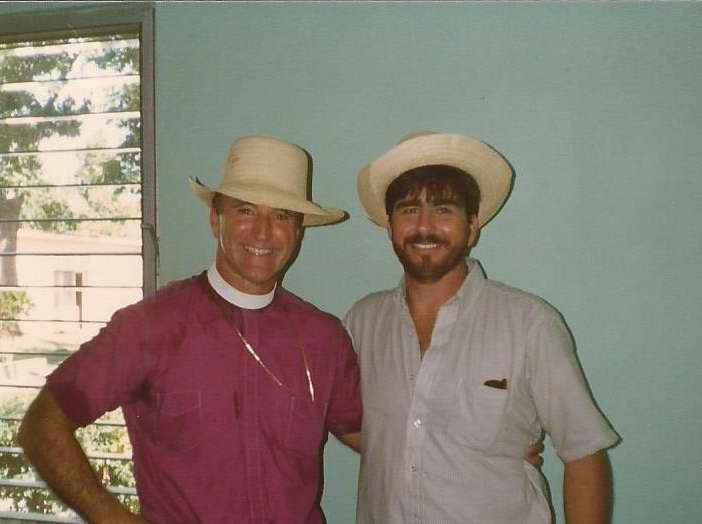 As debate went well into the evenings in committee at the 79th General Convention in Austin—culminating with the readmission of the Diocese of Cuba into the Episcopal Church after 52 years—I could not help but remember my first experience with the island. Before I began my studies at General in 1988, I had already spent one year at El Seminario Evangélico de Teología in Matanzas, Cuba. The Bishop of Florida had sent me to our new companion diocese to get some “life experience,” in his words. It was an unforgettable year, traveling the country in the mid-1980’s, long before Cuba had become the destination of bucket lists and cruise ship layovers. I was, for many of the young people I would meet, the first (North) American they had seen in person after decades of isolation. Each week after classes, I would board the Hershey Railway for Havana, a creaky old electric train that had been built in 1917 to transport Cuban sugar to export to the U.S. to make chocolate. My field placement, as it were, was to help the dean at the cathedral, often as his driver for pastoral visits around the interior of the island. Each Cuban priest then and now serves a handful of worship communities. The mid-1980’s was an era when Christians were still widely discriminated against by the Cuban government and church properties were decaying and sparsely attended. The island had not yet seen Papal visits and religion was very much private. In looking back through my photo album, I realize that I may have been the only person with a camera in those days taking pictures of church conventions and parish activities, including the ordination as deacon of current Bishop Griselda Delgado del Carpio in 1986. Over the years I have led countless mission trips, sponsored refugee families to come to the U.S., and even encouraged my son to take a gap year during college to be the first Young Adult Service Corps (YASC) volunteer in Cuba in 2013 (where he met and would later marry his Cuban bride). In 2015, I was appointed a member of the Task Force on Cuba that met in preparation to General Convention and wrote a comprehensive report that recommended that Cuba be welcomed home. As I attended the Austin hearings, offered testimony myself and listened to the debate at the Episcopal Church in Cuba Committee, it was soon clear that many constitutional and canonical conflicts existed that could have potentially derailed the resolution to reunite Cuba with the Episcopal Church, perhaps for another triennium. Cuba had waited long enough and in many of our minds could not wait another three years. In 1966 the House of Bishops had voted unilaterally to separate Cuba from the Episcopal Church, thus creating an extra-provincial diocese under the authority of the Metropolitan Council. Over the subsequent decades the Anglican Church of Canada filled the void and offered critical mission support and solidarity. My one-time General tutor William “Chip” Stokes, Bishop of New Jersey and co-chair of the committee, was masterful in weighing various paths while keeping Gospel reconciliation at the center of the deliberations. General Seminary trustee Bishop Andrew Dietsche, the Bishop of New York, as a member of the committee and a friend of Cuba offered context and timely assurance that there could be a way forward to embrace the moment and move on the resolution at the current convention. Bishop Delgado, who received an honorary doctorate from General in 2017, has been a tireless leader and ambassador for a long isolated church. Plans for dioceses to help pay the five-decade long pension arrears are now underway. Pray for Cuba. Economic conditions have declined over the years as their patron Venezuela falls deeper into chaos. The once hopeful Obama thaw in Cuba-U.S. relationship has been replaced by Trump-era hardline rhetoric and greater isolation. No visas are currently being issued for Cuban nationals from the American Embassy in Havana, making it even more difficult to foster closer ties. In Austin, The Episcopal Church made things right. Now may God continue to guide this holy work of mission. The Rev. Mark B. Pendleton, Class of 1990, serves as Rector of Christ Church in Exeter, New Hampshire, and is a member of General’s Board of Trustees.